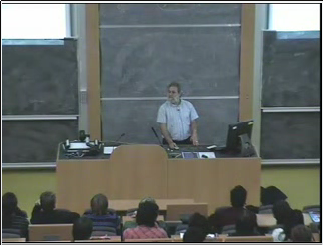 Videos of my 2009 lectures on functional programming in Haskell are available online from the University of Edinburgh. There seems to be a cottage industry in videos explaining monads, see Lectures 18 and 19 (and 16 and 17) for my version, or see How to Declare an Imperative and Monads for Functional Programming if you prefer text to video. Course content begins around 31:25 into lecture 1. Where can we find these course assignments/howeworks. @Arthur: Additional material for the course is at http://www.inf.ed.ac.uk/teaching/courses/inf1/fp/2009/. which resolves to SERVICE UNAVAILABLE. INF are able to be downloaded. Even though the titles say "Download", one must still ctrl+click and save link as ..
@Stephen: Thanks for noting the problem. I've submitted a ticket to track down the videos. Meanwhile, I gather they are available via YouTube.